Aboriginal paintings are maps of land. It is necessary, however, to define precisely what is meant by a 'map' in this context. The danger is in transferring too literally a Western concept of topographical map on to Aboriginal cultural forms and making them into something they are not. 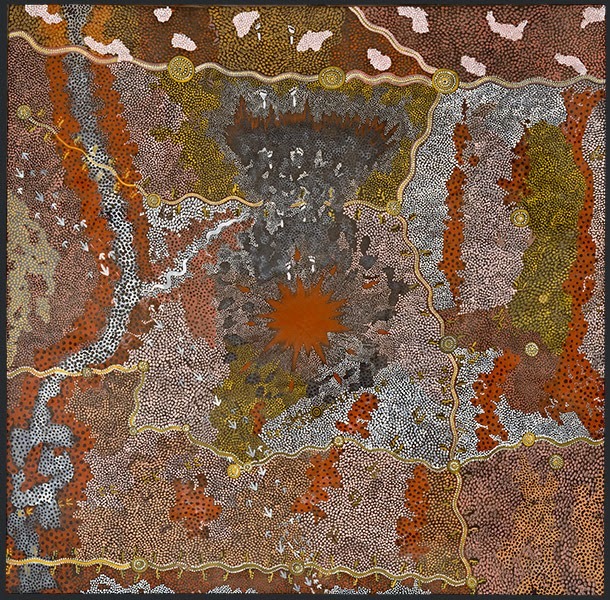 Paintings are often discussed as if they were bird's-eye views of particular areas of land, as though reflecting an Aboriginal tradition of aerial photography. Seeing Aboriginal paintings from this perspective is superficially inviting because it provides a way in which people from another culture can find meaning in Aboriginal art. It is possible to relate nearly all Aboriginal art to landscape. But taken too far the analogy between Aboriginal art and maps can mislead because it oversimplifies and gives the wrong emphasis. From an Aboriginal perspective the land itself is a sign system. The Dreamtime ancestors existed before the landscape took form; indeed, it is they who conceived it and gave it meaning. Rather than being topographical representations of landforms, Aboriginal paintings are conceptual representations which influence the way in which landscape in understood. When Aboriginal paintings do represent features of the landscape, they depict them not in their topographical relations to one another but in relation to their mythological significance. Image: Warlugulong (1976) by Clifford Possum and Tim Leura via NGV. P.S. A comment from 2007 by Andrew Ray on the work of Rover Thomas.